The Naked-rumped Tomb bat is a rather large bat with short, light brown fur. Associated with arid and semi-arid regions, it is known to roost in crevices in rocks, tombs, cliffs and buildings. This species is a fast flier, hunting in the open air for beetles, crickets, moths, grasshoppers and other insects. Some individuals hibernate in the colder months but others are known to migrate in winter once they have accumulated fat deposits. 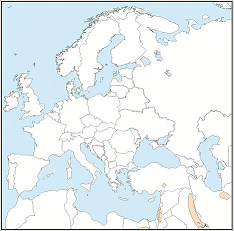 Naked-rumped Tomb bat has been recorded from Morocco, through the Saharan region across northern Africa to Egypt and north through the Middle East to southern Turkey and the more arid areas of the Indian subcontinent. Loss of roosts and the effects of pesticides. Quite tolerant to a certain level of human disturbance.